That was the word one observer used to describe an 11 percent increase in pedestrian traffic deaths. That’s the highest single-year increase ever and almost twice the size of the increase in traffic deaths overall. Lower gas prices and a better economy mean that more cars are on the roads, and a significant number of those drivers do not watch the road, at least in the way that they should. Furthermore, although many new cars have sensors that detect pedestrians, many motorists do not know how to use the technology, so they disable it. To stem the rising tide of pedestrian fatalities, New York City lowered its speed limit to 25mph on many non-through streets, and other cities may follow suit. Advocates are also pushing for wider sidewalks and improved road designs, such as longer red lights that give pedestrians more time to cross the street. Driver distraction is one of the primary causes of auto-pedestrian accidents. Since the beginning of the smartphone era in about 2008, pedestrian fatalities have increased almost every year and now, for the first time in twenty years, may eclipse 6,000 annual deaths. 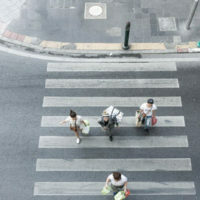 Most pedestrian fatalities happen outside of marked crosswalks, a statistic which indicates that visual distraction (taking one’s eyes off the road) may be the primary culprit. Many people drive almost in an autopilot mode, responding only to sudden movements, like a fast-moving car or a changing traffic light. Slow-moving pedestrians simply fail to register, a deficiency enhanced by the fact that, outside marked crosswalks, many drivers simply are not watching for pedestrians. Speed is a factor both in pedestrian crash causes, and perhaps more significantly, in the injuries that these victims sustain. Velocity increases stopping distance, which is the distance that a moving vehicle requires to stop or slow down safely, thus reducing reaction time. Moreover, vehicle speed exponentially affects injury. The serious injury rate is 10 percent at 20mph and 90 percent at 45mph. Unfortunately, most pedestrian accidents occur on high-speed limit through streets. Florida is a no-fault auto insurance state, so if victims sustain non-serious injuries, like a road burn or perhaps a broken tooth due to a fall, they may file claims against their own insurance companies and obtain compensation for their economic losses. Significant and Permanent Loss of Function: This category usually includes the loss of a sense, such as hearing or vision, due to a head injury or other wound. As a rule of thumb, anything more than 10 percent is probably significant. Permanent Injury: Most serious injury cases fall under this category, which could include loss of motion due to a broken arm, a hip replacement necessitated by a fall, and the list goes on. Usually, “permanent” does not mean forever, but rather long-lasting. Scarring or Disfigurement: Scars on any visible or semi-visible part of the body are generally considered serious injuries. Death, from whatever cause, is also a serious injury, assuming that the injury was a foreseeable consequence of the car crash. Crossing the street is risky. For a free consultation with an experienced personal injury lawyer in Brandon, contact Reed & Reed.